Johann Georg Repp was born in Norka, Russia on October 8, 1867, the son of Peter Repp (born 1828) and Elisabeth Döring (born 1832). Elisabeth and Peter immigrated from Russia in 1886. They departed from Hamburg, Germany on June 4th and arrived in New York on June 17th aboard the steamship Suevia. Johann Georg and his siblings Conrad and Elisabeth joined their parents on this migration. After their arrival, the family initially settled in Sutton, Nebraska where Peter died. Johann Georg (George) married Margaretha Sophia (Margaret) Wolf who was born on July 28, 1866 in Norka. Margaretha arrived in the United States in 1890 and her marriage with George must have occurred soon after. Their first child, Amalia (Mollie) was born September 5, 1891 in Portland. At least six more children would follow: George Ludwig, Heinrich, Elizabeth, Maria, Conrad and Johannes. George and Margaret were charter members of the Ebenezer German Congregational Church that was founded in 1892. George's mother and his brother Conrad were also founding members of the church. George's brother, Heinrich Repp (born September 7, 1852) and his wife Margaretha Fink were also early settlers in Portland, arriving in 1892. In 1910, George is listed in the census as a garbage hauler (scavenger) and owns his own wagon and team of horses. By 1920, George had retired and he and Margaret were still living with many of their children at 413 Knott Street. Margaret died on December 25, 1921 and she was buried at the Rose City Cemetery in Portland. 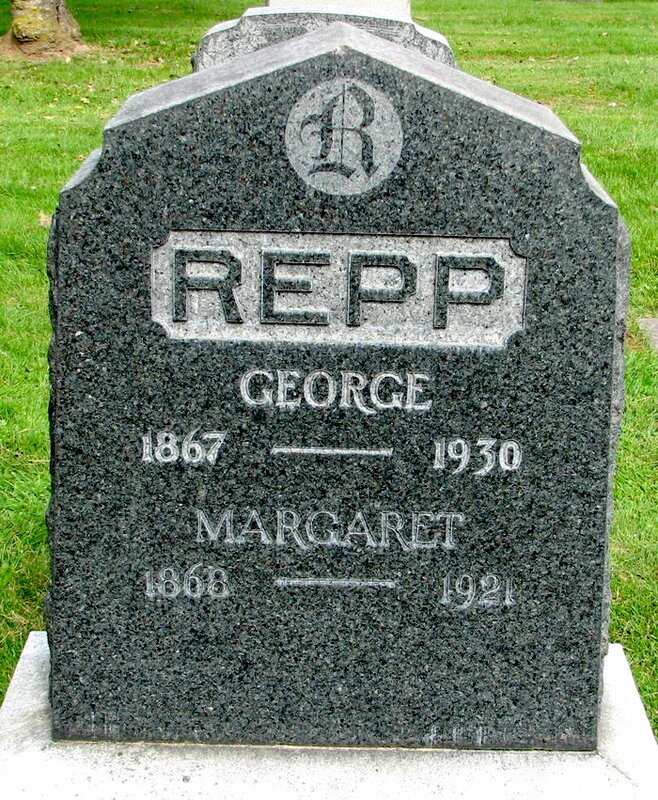 ​George Repp died May 17, 1930 as is buried with Margaret at the Rose City Cemetery.